Laparoscopic inguinal hernia repair requires extensive preperitoneal dissection for placement of mesh prostheses. Identifying known and expected anatomy within this preperitoneal space is crucial to the successful repair of inguinal hernias without complications. Proper dissection involves confident recognition of major pelvic vasculature. When vascular structures lie within their anticipated anatomic locations they are easily left undisturbed, yet aberrant vasculature are more prone to injury. 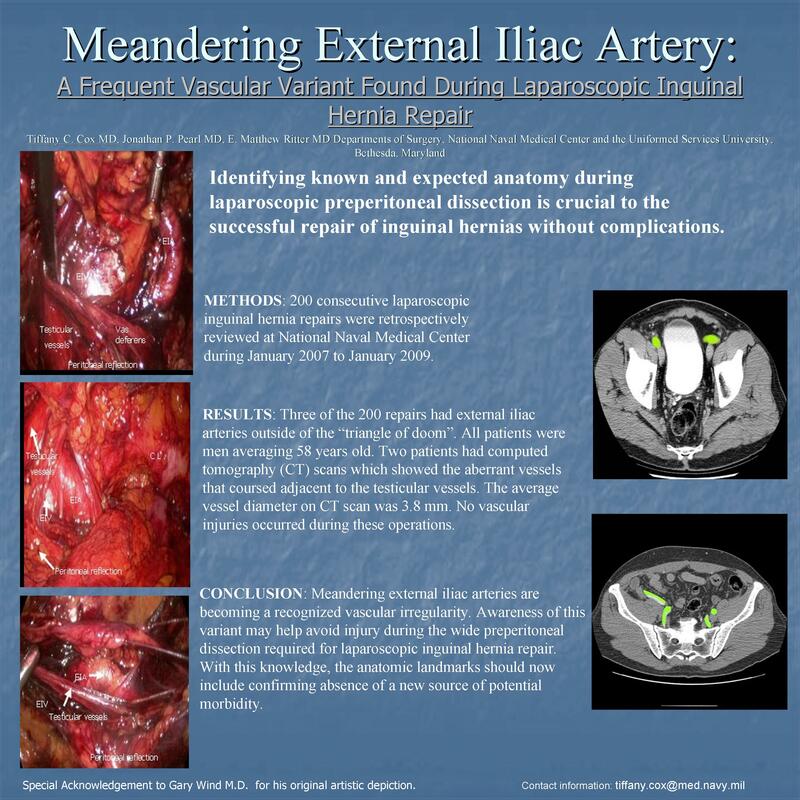 We report a series of meandering external iliac arteries found outside their normal location during laparoscopic inguinal hernia repair. Methods: 200 consecutive laparoscopic inguinal hernia repairs were retrospectively reviewed at National Naval Medical Center during January 2007 to January 2009. All external iliac vascular irregularities were included in this series. CT scans were reviewed as applicable. Results: 200 totally extraperitoneal laparoscopic inguinal hernia repairs were performed over 24 months. Three of the 200 repairs had external iliac arteries outside of the “triangle of doom”. All patients were men with an average of 58 years old. Two of the included patients had computed tomography (CT) scans which showed the aberrant vessels that coursed adjacent to the testicular vessels. The average vessel diameter on CT scan was 3.8 mm (range 3.0-4.5 mm). No vascular injuries occurred during these operations. Conclusion: Meandering external iliac arteries are becoming a recognized vascular irregularity. Awareness of this variant may help avoid injury during the wide preperitoneal dissection required for laparoscopic inguinal hernia repair. With this knowledge, the anatomic landmarks should now include confirming absence of a new source of potential morbidity.